Several alternative economists and financial analysts rightly predicted that the central banks and establishment financiers were holding off a financial collapse until after the election as a way to try to ensure Hillary Clinton won the Presidency. And judging from the market turmoil occurring over the past two days since Donald Trump shocked the world, the dyke holding back the chaos appears now to have broken wide open. Over the past year we have seen the world’s second biggest shipper file for bankruptcy, currencies such as the Euro, Pound, and Yen get crushed against the dollar, and bond yields fall to negative territory for many sovereign countries. 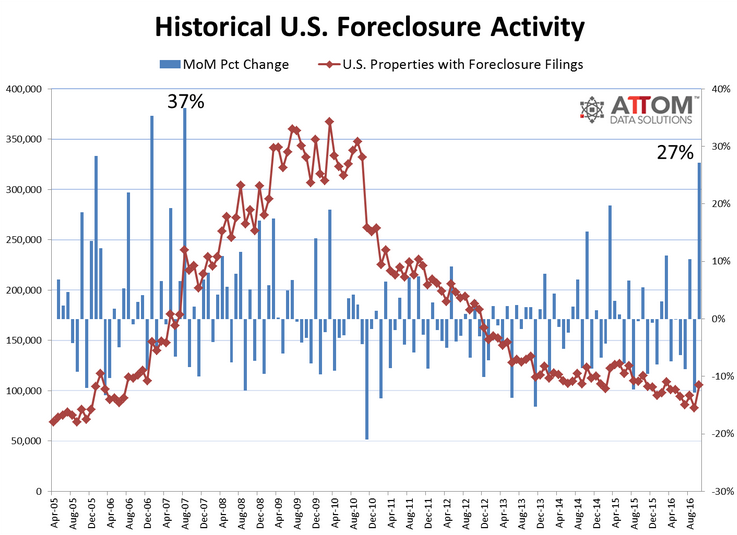 And besides the beginning collapse of housing bubbles in both Canada and the UK, it appears as well that the bursting of the U.S. housing bubble could be underway with a massive spike in foreclosures that were buried in October from the general news. What this rise in foreclosures warrant, along with price collapses in oil, copper, and gold as well as bond yields in the U.S. rising to a near record spike for one day, is the sudden advent of deflation that could not only eliminate the potential of a Fed rate hike in December, but also open the possibility of a rate drop and new quantitative easing. Inexplicably, the same markets that priced in a Clinton victory and a continuation of the status quo are now pricing in the financial crisis the central banks covered up until Nov. 8 to try to promote a political agenda. But in the end it never mattered who won the White House last Tuesday because the economy was overdue for a financial crisis that just happened to be released the moment a new President-Elect was selected.